Leverage Excel skills, while you blow past supposed “Excel limits” and deploy models to servers and cloud. Analysts and developers have a common language: Excel + RASON + SDKs -- on your or cloud servers. Insights are nice. Saving serious money is better. Our customers have saved millions - you can too. Grow your analytics skills while you get results with our wizards, online courses and expert support. Want to learn and use data science (predictive analytics) and/or management science (prescriptive analytics)? 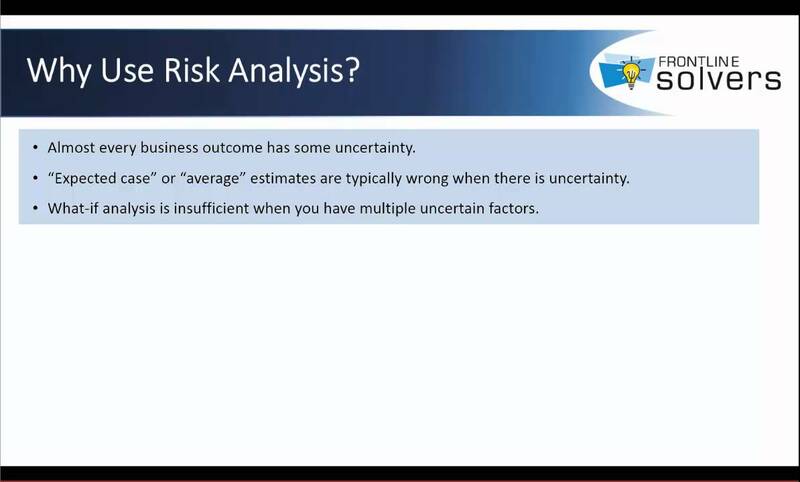 Use our powerful Excel based tools, RASON modeling language, and our learning resources to get results quickly. You can even work directly with a developer in your company who doesn't use Excel. Analytic models in our RASON modeling language or in Excel run directly in our SDKs and REST API. Want to learn and use data science (predictive analytics) and/or management science (prescriptive analytics)? Use our powerful SDKs from your favorite programming language, and our learning resources to get results quickly. 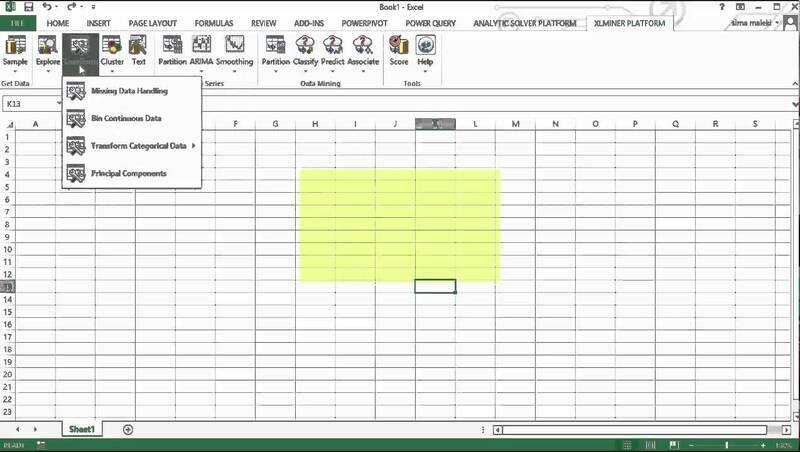 You can even work directly with a business analyst in your company who uses Excel. Analytic models in our RASON modeling language or in Excel run directly in our SDKs and REST API. Want to get results from analytics in months, not years? That's what we do best. Use our powerful software tools and training to get quick wins on your first projects, while you grow analytics expertise in the people you have. Enable business analysts and developers to work together, to quickly move a project from a prototype (easier in Excel) to production in a server or cloud based application. Finance/Investment: Cash management, capital budgeting, portfolio optimization. Manufacturing: Job shop scheduling, blending, cutting stock problems. Distribution and Networks: Routing, truck loading, fleet scheduling. 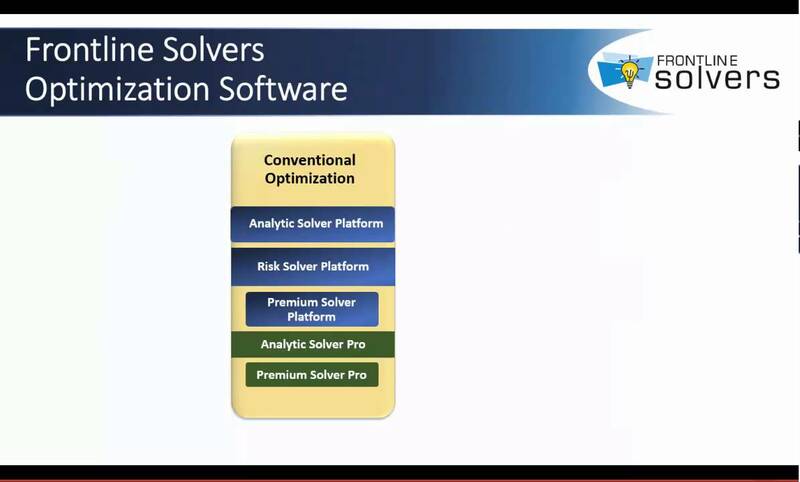 The Premium Solver Platform with Xpress Solver engine has been a huge asset to us. We have been able to utilize the solver’s capability to run extremely complex models of our distribution network uncovering large savings; our first project uncovered nearly $1MM in savings. The Frontline Premium Solver was very helpful in solving a large water reuse optimization problem for one of our manufacturing plant. It was also very easy to integrate with Excel.